The Christ of God, Jesus, was a long-expected Savior but he’s always on-time! Advent, his coming, was that moment, the “fullness of time” for eternal God “to send” [missio, Latin] his Son to be our Savior (Gal. 4:4). Christmas made God’s “mission possible”. It was the right or a better term is the “ripe” time for the surrounding historical (chronos) and opportune events (kairos): Roman rule (pax Romana), Hebrew monotheism and Greek learning had all come together preparing the way for our Lord. At times I wish God showed me his will – what to do, say or where to go – well ahead of time. Is he teaching me to trust him one day at a time? Yet he turns up always “on time”; not too early and never late! Amazing facts about Christmas show us God is always right and right on time: Besides arriving at the right period chronologically, Jesus was born at the right place geographically, foretold some 700 years (Micah 5:2). Think of the probability of a Governor Quirinus issuing a decree for Joseph to go to Bethlehem at the exact time Mary was expecting? Jesus was born of right parenthood genealogically (2Sam.7:12). Joseph was of the lineage of King David and Mary was prepared right biologically as a virgin to conceive. Impossible without God’s intervention! (Isa. 7:14) Yet all this was that theologically Jesus could be born for the right purpose. Christ “came into the world to save sinners” – to put us back into a right relationship with God (1Tim. 1:15). A closer look at these Christmas figures reveals that their hope was not wishful thinking. It was grounded in God’s Word! Having received his promise, waiting was their active stance. They were attentive to what God was doing and responsive in obedient faith. They possessed God’s love that cast out all their fears and were strengthened by the joy of the Lord amidst suffering. As we approach a New Year 2012, despite defeats and disappointments, let us wait on the Lord for strength and renewal (Isa. 40:31). Christmas teaches that all who wait in hope on this On-time God and don’t lean on their own understanding, do find sufficient grace in time of need. Divine providence and guidance are ours since this On-time God makes all things beautiful in his time! 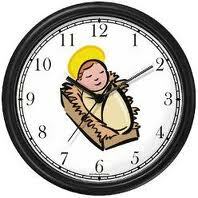 Yes our God is an on time God- In this fast world no body has time or patience to wait, but we are reminded throughout the Bible about the right time & you have brought out the truth through the characters of Anna,Simeon,Elizabeth, Zachariah,Mary, Joseph & Shepherds.. the importance of waiting. Thank You Pastor for sharing. Thanks Chris – I always love your Christmas reflections! What an amazing thing that God came to be with us and is still with us today. God bless you, Dorothy, Aleethea and Charis this Christmas. This is aptly connecting to our need to be patient while waiting for God’s time in everything we do by word or deed. Yes, we need to wait to say things in the right time. I am amazed at God’s ways to do things and say things,all for our good and His glory!